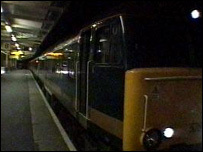 Train company First Great Western has said it may have to reintroduce an extra carriage on the overnight sleeper service to Cornwall. Until last December, the future of the London to Penzance service was under threat as it was running at a loss. Now users who campaigned to save it say it is proving so popular it can be difficult to book a berth on the three-carriage train. First Group said the fourth carriage was removed as a cost-cutting exercise. Robin Hanbury-Tenison, from Bodmin, who has used the sleeper service on a regular basis for 45 years, said First's decision to reduce the number of carriages on the train was frustrating and annoying. He told BBC News: "It's been hugely popular and virtually full every night. Now it's gone from four carriages to three and everyone is trying to squeeze in." Business Manager Julian Crowe said under the previous franchise the service was heavily subsided and the Department for Transport felt it did not represent value for money. He said part of the First package to save the sleeper train involved making significant economies, which included removing the fourth carriage. Mr Crowe told BBC News: "At the time, the average number of people using that coach between Plymouth and London was just four a night. Now the position has changed quite dramatically. "Probably because of the publicity the train's had, it's reminded people that the service exists and it's more popular now than I can ever remember and we obviously don't want to be turning custom away"
He said the company would be investigating whether it could financially justify restoring another carriage to the train from its first stop in Penzance. Andy Roden, from the Sleeper Night Users Group, which campaigned to save the overnight service, said the sleeper had become a victim of its own success and the extra carriage should be put on immediately.